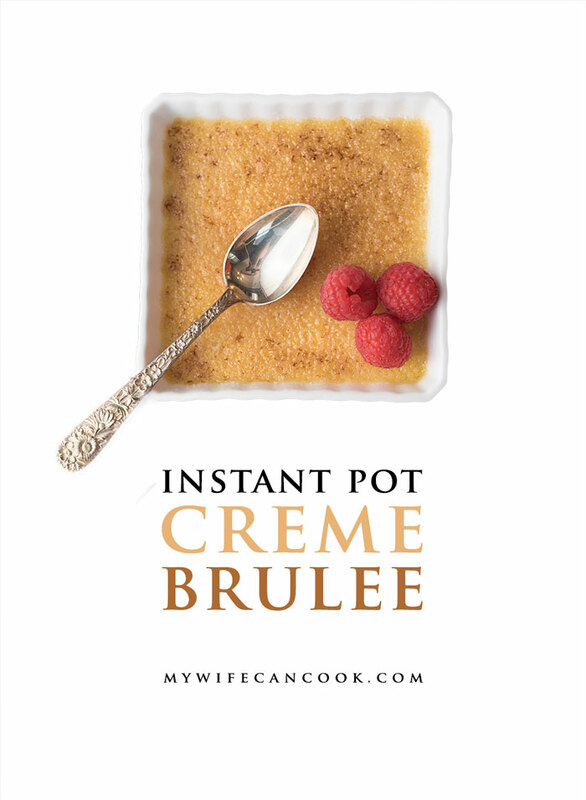 Today we’re sharing our recipe for Instant Pot creme brulee. 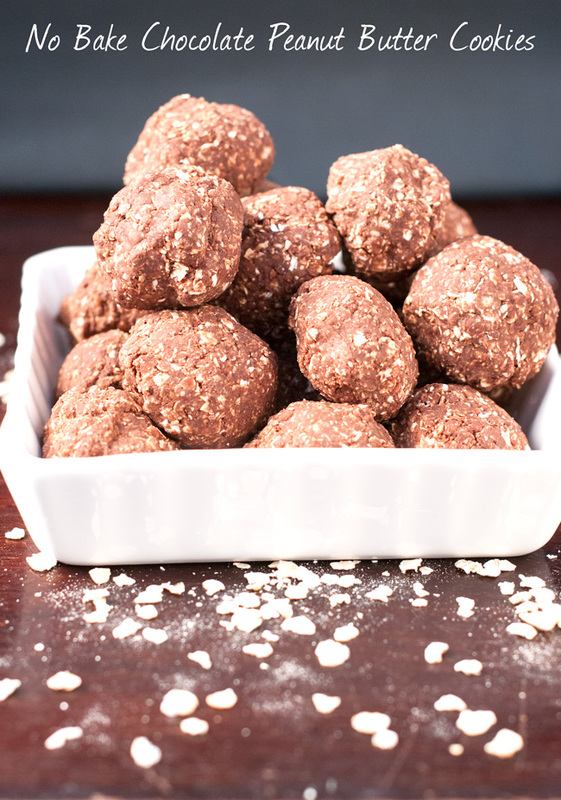 It has always been one of my favorite desserts, but I’ve always been a little intimidated by the thought of making it at home. Until now! I’ve come up with the following easy to execute recipe for making creme brulee that has helped me move past the intimidation and on to the goodness. 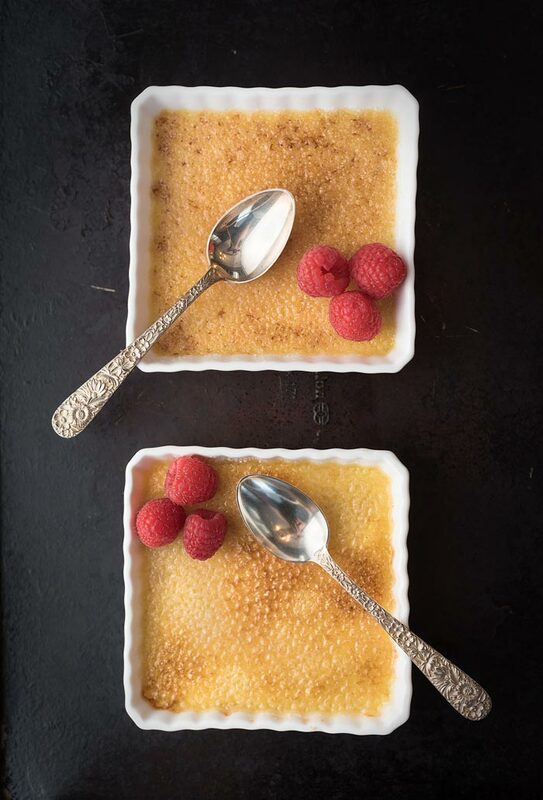 Read on for all the steps and my simple tricks for how to make creme brulee the easy way. Creme brulee — officially written Crème brûlée with the French accents over the letters, but I’m not fancy enough to continue that for a whole post — is a French name which translates to burnt creme and it’s a popular dessert that consists of a rich custard base topped with a thin hard caramel. 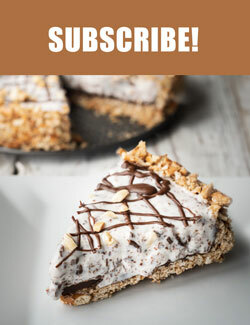 And it’s one of my favorite desserts! 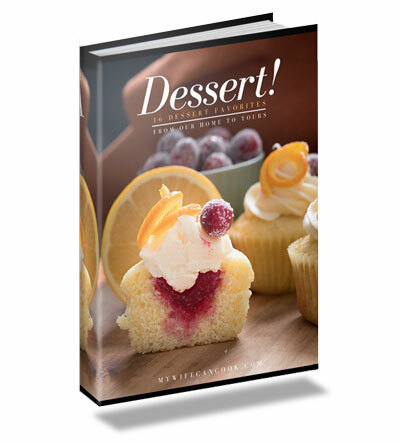 Anyone else always have to look at the dessert menu at restaurants? Even if you’re stuffed? If so, I understand. I always look! Because if creme brulee is on the dessert menu, I’ll find a little extra room and I’ll order it. Usually, it’s totally worth it, but I hate those times when it ends up to be a disappointment. If the custard is too thick or too runny it’s just not the same. And if the caramel doesn’t have that good crack when you tap it with your spoon..forgettaboutit. 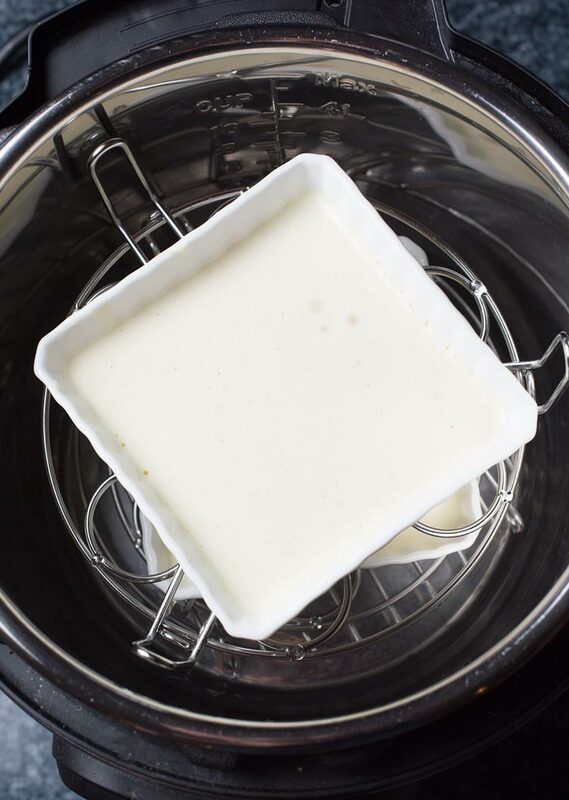 The biggest hurdle to Instant Pot creme brulee is choosing the right baking vessel. Six-ounce glass pyrex bowls will work, but a shallow, wider ramekin works better to get more of that caramelized sugar top we love so much. 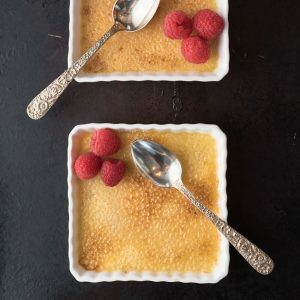 This bon-appetit article on common creme brulee mistakes actual lists using too deep of a ramekin as a common mistake. I agree in this instance, but I’ll also say that I think the only true mistakes are the ones that result in something YOU don’t enjoy. You can absolutely learn from others in the kitchen, but you also can’t be afraid to find your own way. If something works for you, it works! I tried both stacking our square ramekins and using our egg racks to get multiple containers into the pot. After a little trial and error, I found that putting a trivet in the bottom, then using the two shelf egg rack upside down worked perfectly. The racks kept the ramekins separate and you can grab the legs and pull out the containers without spilling or needing a foil sling. Below, I’ve included a link (	important affiliate link disclosre	) to the egg rack we used along with a top down setup shot of what it all looks like in the Instant Pot. For flavor, I went for the classic vanilla creme brulee. I had some vanilla bean paste that I received as a gift and had been waiting for a special occasion to use it. If you don’t want to splurge on something you aren’t going to use very often, just add some vanilla extract to the egg/sugar mixture. For the best results, just use the egg yolk for creme brulee. You want your custard to remain rich and creamy and avoiding egg whites helps ensure your custard doesn’t become overly set/firm. You also want to take care when you lift off the top of the Instant Pot to ensure you don’t let water drip into your custard. After taking care to get the right custard consistency, you don’t want it to suddenly turn soggy thanks to drops from the lid. As for your extra egg whites, just save them for a batch of scrambled eggs or an egg white omelette. This time around I actually fed our extra egg whites (as a fried egg white) to our 6-year-old for breakfast. She said she liked them (a small miracle!). Just as important as the custard is getting the perfect hard caramel layer on top. An important part of this is your choice of sugar. I’ve seen many recipes calling for caster sugar or demerara sugar, but I actually just used regular white granular sugar for the top of this Instant Pot creme brulee. 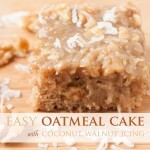 I’ve read that superfine sugar is ideal, but this turned out perfectly with the same kind I use for any other baking. Again, if it works for you, it works! However, I do think some of the raw and larger crystal sugars that are popular now would probably be a mistake. The logic behind using fine sugar is that it caramelizes quickly and so you’re less likely to go too far trying to caramelize it and end up with something that is overly burnt or with liquidy custard. The common method for caramelizing the sugar is to use a blow torch and the aforementioned bon appetit article on creme brulee mistakes actually lists trying to broil the caramel as a mistake, but guess what? I used our broiler and it worked great! I know, I know…I’m a bit of a brulee rebel. 🙂 But I’ll continue to fly the “if it works for you, it works” flag and stand behind the option of broiling your caramel if you try it and it comes out as you like it. I think the reasoning behind using a torch is that you really get a concentrated blast of heat that’s great for getting a nice even top layer without burning it or ruining the custard layer below. And I do think a torch is an ideal option — I even have one, I just have no idea what box or hidden cupboard it got stuffed into ages ago — but I also think there’s nothing wrong with using your broiler if you can pull it off. We have a gas range with a good broiler so I gave it a whirl and it worked well. I even have a friend that I know has used her electric oven broiler. If you do use a broiler, just watch it closely because it can cook unevenly or burn and you may have to rotate it. Under our broiler, it took about 4 minutes. If you do have a torch it’s the #1 option and you’ll make bon appetit happy. However, if you don’t, join us in the realm of creme brulee rebels. Making creme brulee in an Instant Pot is probably a little rebellious to begin with so why not go all the way and caramelize your sugar under a broiler? Scald heavy cream in a small saucepan on the stove until bubbling around the edges. Turn off heat and whisk in vanilla bean paste and salt--cool (in fridge if you want to speed up the process) while mixing the other ingredients. Beat egg yolks with 1/4 cup sugar. Beat in heavy cream mixture (make sure cool enough). Spray two 6 ounce ramekins or small glass pyrex bowls. Place trivet in Instant Pot and pour one cup of water into bottom of pot. Place ramekins in Instant Pot on top of trivet. Close and seal lid and select manual and toggle to 8 minutes. Once cycle is complete, let naturally release for 15 minutes. Open lid and carefully remove ramekins and cool for at least 2 hours in the fridge. Sprinkle a tablespoon of sugar on top of each ramekin. Broil (or use handheld torch) each ramekin for 3-5 minutes. Sugar should bubble and turn slightly brown. Keep a close eye during this as it can burn or cook unevenly. 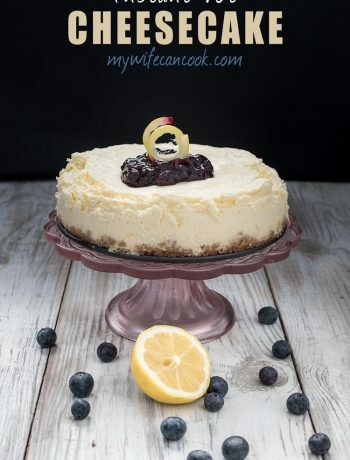 I love creme brulee but have never made it before because I thought I had to have the torch! I’m going to have to try it under the broiler as well! This is too cool! Actually I don’t think creme brûlée is nearly as hard to make as people think it is (and it’s one of my favorite desserts to make)- normally it takes almost an hour to bake. Plus chilling time. This is so fast! It is pretty easy. 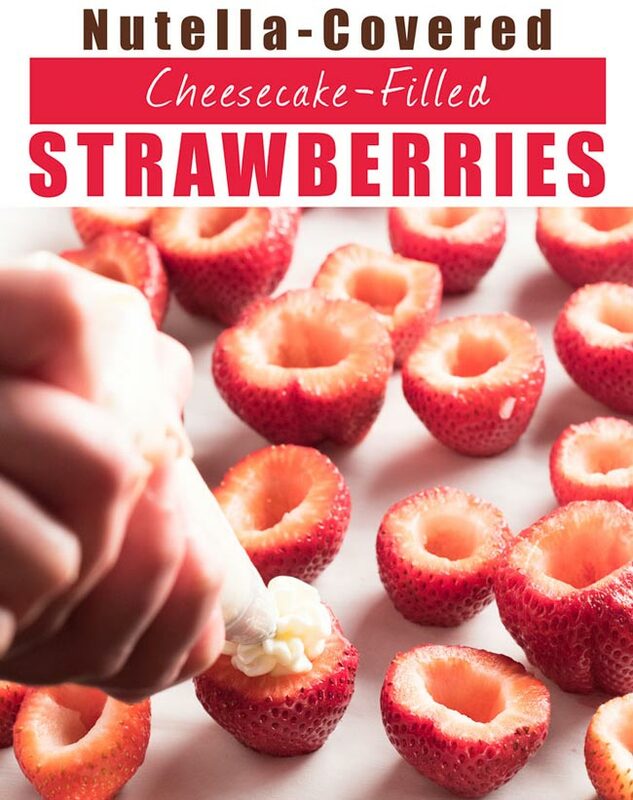 Just not a dessert you can whip up quickly due to the chilling. Although, I made it on the day it was 10 degrees here and threw it outside. It chilled pretty quickly. I’ve heard people say having a different seal doesn’t really make a difference. But our first batch of creme brulee definitely tasted like a hint of chili or curry. Yuck! We want you to know some of the links below are affiliate links, which means that if you make a purchase, We earn a small commission. This commission comes at no additional cost to you. Understand that we will only recommend products and resources we believe in! Any commissions we earn aid us in our mission to better serve our readers, but, obviously, please do not spend any money on anything unless you feel you like it's right for you.